In Ontario, the number of job vacancies rose by 27,000 (+14.1%) compared with the fourth quarter of 2017. This rise was spread across several sectors, with health care and social assistance, administrative and support services, and construction contributing to more than half of the provincial growth in job vacancies. In the fourth quarter, these three sectors accounted for just under one-quarter of payroll employment in the province, according to the Survey of Employment, Payrolls and Hours (SEPH). Compared with the same quarter one year earlier, the job vacancy rate in Ontario increased 0.3 percentage points to 3.3%. The offered hourly wage in Ontario was up $1.55 (+7.6%), the largest increase among the provinces. The largest growth in the average offered hourly wage in the province was in accommodation and food services (+14.9%). 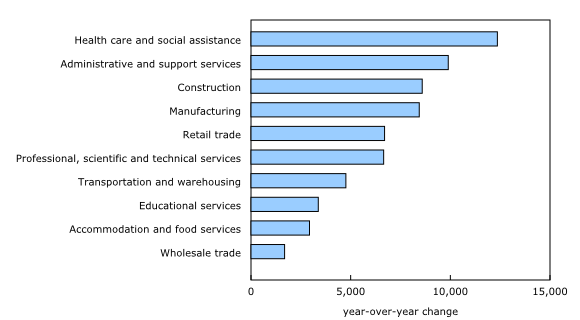 There was also a large increase in offered wages for vacant positions in the retail trade sector (+10.4%). This coincided with the minimum wage increase in the province from $11.60 to $14.00 on January 1, 2018. Year over year, the number of job vacancies was little changed in both sectors in Ontario in the fourth quarter, while employment was up. The number of job vacancies in Quebec grew by 25,000 (+27.5%) year over year in the fourth quarter. The pace of growth in job vacancies was the third highest among the provinces behind Prince Edward Island (+58.1%) and New Brunswick (+29.9%). The increase in the number of vacancies in Quebec was driven primarily by the health care and social assistance, retail trade and manufacturing sectors. The highest year-over-year growth rate was in construction (+59.3%). On a year-over-year basis, the job vacancy rate was up 0.6 percentage points to 3.2%, while the offered hourly wage grew by $0.40 (+2.0%) to $19.95. There were 16,000 (+18.1%) more job vacancies in British Columbia year over year in the fourth quarter. Job vacancies were up the most in professional, scientific and technical services, transportation and warehousing, as well as agriculture, forestry, fishing and hunting. On a year-over-year basis, the job vacancy rate in the province rose 0.5 percentage points to 4.5%, the highest rate in the country. The $1.40 (+7.1%) increase in the offered hourly wage trailed only Ontario. The minimum wage in British Columbia increased from $11.35 to $12.65 on June 1, 2018. In Alberta, the number of job vacancies increased by 3,800 (+7.3%) from the fourth quarter of 2017, driven by the administrative and support services, and transportation and warehousing sectors. There was also a notable decline in the number of job vacancies in the mining, quarrying, and oil and gas extraction sector. Over this period, the job vacancy rate rose 0.1 percentage points to 2.7% in the fourth quarter, the fourth lowest rate among the provinces. In addition, the offered hourly wage rose by $1.20 (+5.4%) to $23.25, the highest offered hourly wage among the provinces. Employers in all four Atlantic provinces reported more job vacancies compared with the fourth quarter of 2017. This was the third consecutive simultaneous year-over-year increase in the number of job vacancies for all four Atlantic provinces. This increase was led by New Brunswick, where employers reported 2,100 (+29.9%) more job vacancies since the fourth quarter of 2017. In addition, the number of job vacancies was up in Nova Scotia (+1,000 or +10.3%), Newfoundland and Labrador (+900 or 25.6%) and Prince Edward Island (+800 or +58.1%). This coincided with decreases in the unemployment rate from the fourth quarter of 2017 to the fourth quarter in 2018 in three of the four provinces, with little change in New Brunswick, as reported in the Labour Force Survey (LFS). 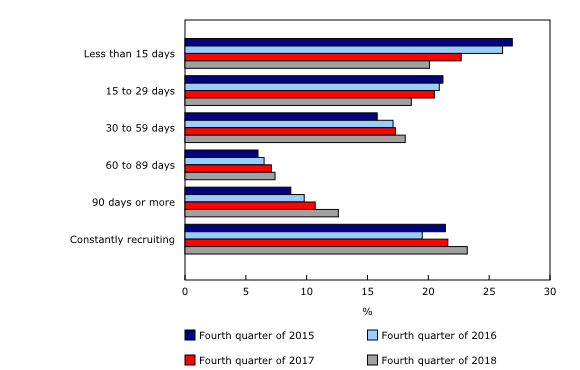 The number of job vacancies in Saskatchewan declined by 500 (-5.7%) year over year in the fourth quarter, the lone decline among the provinces. The job vacancy rate decreased 0.1 percentage points to 1.9%, the lowest rate among the provinces. At the same time, the offered hourly wage was up $0.80 (+4.0%) to $20.95. Economic region data highlight the diversity of regional labour markets across Canada. In the fourth quarter, 41 of the 69 economic regions recorded year-over-year increases in job vacancies, led by North Coast and Nechako, British Columbia (+80.1% or +700). At the same time, strong growth rates were also observed in Prince Edward Island (+58.1% or +800), Fredericton–Oromocto, New Brunswick (+54.7% or +600) and London, Ontario (+51.6% or +3,900). Of the 10 economic regions with the largest job vacancy growth rates, 4 were in Quebec. These economic regions were Abitibi-Témiscamingue (+51.5% or +900), Lanaudière (+50.4% or +1,400), Mauricie (+47.6% or +900) and Outaouais (+40.4% or +1,000). In the same quarter of 2017, 49 of the 69 economic regions recorded increases in their job vacancies from the same quarter in 2016. In contrast, four economic regions recorded declines in the number of job vacancies compared with the fourth quarter of 2017. These economic regions were Wood Buffalo–Cold Lake, Alberta (-23.5% or -700), Swift Current–Moose Jaw, Saskatchewan (-23.5% or -200), Northwest, Ontario (-13.7% or -500) and Regina–Moose Mountain, Saskatchewan (-13.4% or -400). The number of job vacancies in the remaining 24 economic regions across the country was little changed year over year in the fourth quarter. Job vacancies rose in the 10 largest industrial sectors (in terms of employment) from the fourth quarter of 2017 to the fourth quarter of 2018, led by health care and social assistance. The sole decrease among all the sectors was in mining, quarrying, and oil and gas extraction. Compared with the fourth quarter of 2017, employers in the health care and social assistance sector reported there were 12,000 (+26.7%) more job vacancies in the fourth quarter. 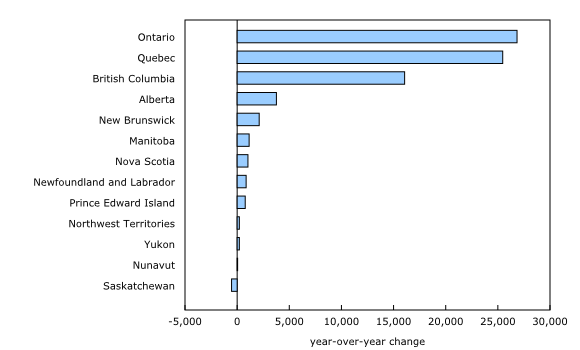 Nearly all of the growth was in Ontario, Quebec and British Columbia. A payroll employment increase in this sector was also reported in SEPH from the end of 2017 to the end of 2018. Over the same period, the job vacancy rate in this sector increased 0.6 percentage points to 2.9%. The number of job vacancies in administrative and support services grew by 9,900 (+29.4%) compared with the fourth quarter of 2017. Ontario, British Columbia and Alberta contributed the most to this rise. Over the same period, SEPH showed payroll employment gains in this sector, mostly in these three provinces. The job vacancy rate in this sector increased 0.9 percentage points to 4.9%, the highest rate among the 10 largest industrial sectors. Over this period, the offered hourly wage increased by $1.90 (+11.5%) to $18.45, the largest increase among the 10 largest industrial sectors. In construction, the number of job vacancies rose by 8,600 (+29.7%) year over year in the fourth quarter. The rate of growth over this period was the fastest among all sectors. This was driven by relatively high rates of job vacancy growth in Ontario (+65.7%) and Quebec (+59.3%). At the same time, the job vacancy rate rose 0.7 percentage points to 3.3%. 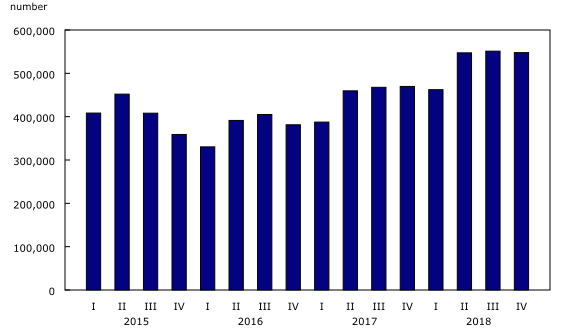 Construction also recorded relatively high payroll employment growth in SEPH from the fourth quarter of 2017 to the same quarter of 2018. Job vacancies in manufacturing rose by 8,400 (+20.9%) in the fourth quarter. Most of the increase was in Ontario and Quebec, while job vacancies in Alberta had the fastest growth rate (+28.0%). Over the same period, the job vacancy rate rose 0.4 percentage points to 3.0%. This coincided with year over year payroll employment growth in manufacturing in the fourth quarter of 2018 as reported in SEPH. In retail trade, the number of job vacancies increased by 6,700 (+9.7%) to the highest level since the beginning of the series in 2015. Just over half of the increase occurred in Quebec. At the same time, the job vacancy rate rose 0.3 percentage points to 3.6%. The offered hourly wage was up $1.05 (+7.6%) to $14.80 in this sector. The growth in this low-wage sector coincided with notable minimum wage increases in 2018 in some provinces, including Ontario. Employers in professional, scientific and technical services reported that there were 6,700 (+22.8%) more job vacancies in the fourth quarter. More than one-third of the growth was in British Columbia. The job vacancy rate rose 0.6 percentage points to 3.7%, which was among the highest rates of all the sectors. Payroll employment in this sector was also up in SEPH. At the same time, the offered hourly wage increased by $1.05 (+3.6%) to $30.25, the highest offered hourly wage of the 10 largest industrial sectors. The duration of job vacancy is the number of days the job has been vacant at the time of the survey. In general, many factors can affect the duration of job vacancies including the characteristics of the position, the offered wage, skills required, recruitment processes and conditions of the local labour market. Since the series began in 2015, the proportion of positions remaining vacant for longer periods of time has trended up, while the proportion of positions vacant for a short time has trended down, as shown in Chart 4. In the fourth quarter, the proportion of jobs that were vacant for 90 days or more at the time of the survey increased 1.9 percentage points to 12.6%, the largest percentage point increase among the categories of job vacancy duration over this period. This was also the highest proportion of jobs that were vacant for 90 days or more in a fourth quarter since the series began in 2015. Moreover, this proportion grew in 7 of the 10 broad occupational groups compared with the fourth quarter of 2017, led by natural resources, agriculture and related production occupations. The growing proportion of longer vacancy durations, combined with other labour market indicators over this period, points to strong labour demand, where it is becoming harder for employers to fill vacant positions. For example, the job vacancy rate in the fourth quarter of 2018 was up, along with payroll employment over the same period in SEPH. According to the LFS, the unemployment rate in both November and December 2018 was 5.6%, the lowest unemployment rate on record since the series began in 1976. The Job Vacancy and Wage Survey (JVWS) provides comprehensive data on job vacancies and wages by industrial sector and detailed occupations for Canada, the provinces, territories and economic regions. Job vacancy and offered wage data are released quarterly. The North American Industry Classification System (NAICS) for estimates from the first quarter of 2015 to the second quarter of 2018 are based on the NAICS 2017 Version 2.0, while estimates for the third and fourth quarters of 2018 are based on NAICS 2017 Version 3.0. Job vacancy data based on the two NAICS 2017 versions are fully comparable. Estimates from the first quarter of 2015 to the first quarter of 2018 are based on the Standard Geographical Classification (SGC) 2011, while estimates for the second to fourth quarters of 2018 are based on the SGC 2016. Collection of the wage component was suspended in January 2018. A study is being conducted on how to provide more detailed information by regions and occupations. Collection of wage information will resume based on the results of the study. JVWS data are not seasonally adjusted. Therefore, quarter-to-quarter comparisons should be interpreted with caution as they may reflect seasonal movements. Summary statistics related to the job vacancy time series from the Survey of Employment, Payrolls and Hours are available in tables 14-10-0224-01, 14-10-0225-01, 14-10-0226-01 and 14-10-0227-01. The National Occupational Classification (NOC) is a four-tiered hierarchical structure of occupational groups with successive levels of disaggregation. The structure is as follows: 1) 10 broad occupational categories, also referred to as one-digit NOC; 2) 40 major groups, also referred to as two-digit NOC; 3) 140 minor groups, also referred to as three-digit NOC; and 4) 500 unit groups, also referred to as four-digit NOC. Estimates from the first quarter of 2015 to the third quarter of 2018 are based on NOC 2016 v1, while estimates for the fourth quarter of 2018 are based on NOC 2016 v1.1. The target population of the survey includes all business locations in Canada, excluding those primarily involved in religious organizations and private households. While federal, provincial and territorial administrations are also currently excluded from the survey, they will be phased in later. Job vacancy data from the JVWS for the first quarter will be released on June 18. More information about the concepts and use of data from the Job Vacancy and Wage Survey is available online in the Guide to the Job Vacancy and Wage Survey (Catalogue number75-514-G). The product "Labour Market Indicators, by province, territory and economic region, unadjusted for seasonality" (Catalogue number71-607-X) is also available. This dynamic web application provides access to Statistics Canada's labour market indicators for Canada, by province, territory and economic region, and allows users to view a snapshot of key labour market indicators, observe geographical rankings for each indicator using an interactive map and table, and easily copy data into other programs. To enquire about the concepts, methods or data quality of this release, contact Dylan Saunders (613-762-6972; dylan.saunders@canada.ca), Labour Statistics Division.